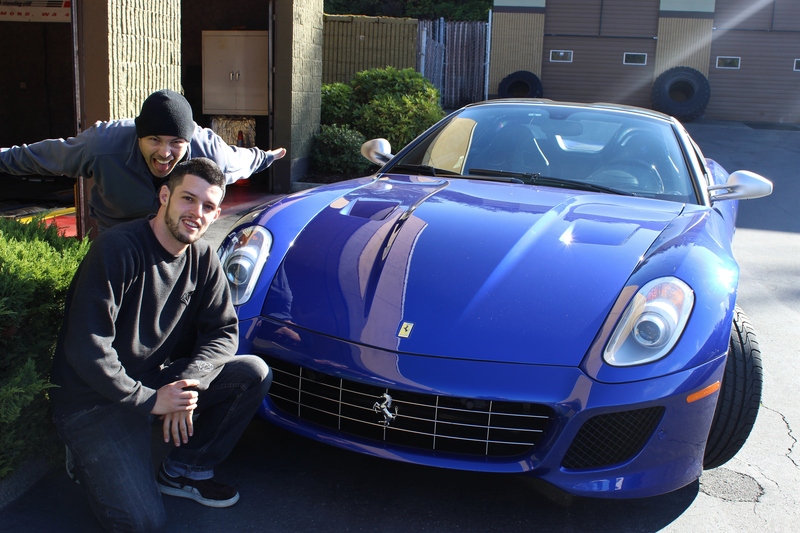 Garrett (kneeling) and Marco pose next to a 2013 Ferrari 599 SA Aperta, which came into the shop to be recorded for Microsoft’s new racing game Forza Motorsport 5. Some may say recent graduate of the Communication Department Garrett Nelson (B.A., 2013) didn’t take a typical path after he walked across the stage and accepted his diploma. He didn’t get a job at a public relations firm or a major marketing company, but instead teamed up with a former Microsoft employee to run a high performance automotive shop. Garrett and Peru-native Marco Yaya are in the process of bringing back to life Dyno Authority – a high performance automotive tuning, custom fabrication and modification company. Originally opened in the late 90s, the shop closed in 2010 when the person running it left. It became a storage space until Marco was getting his wife’s car worked on in the shop across the parking lot and was asked about running the dyno. Marco had just quit his job at Microsoft – a company he had worked at for nearly 18 years. Marco went to college at DeVry University in Texas for a technical degree. He has always been passionate about cars and especially motorcycles, which he used to race when he was a kid. After being asked if he could run the dyno shop, he went to Arizona to attend an advanced tuning program at EFI University. While Marco covers most of the tuning and graph data, Garrett is the one-man communications team, leading the way in marketing, public relations, social media, promotion, and advertising. Garrett used to be a customer at the old dyno shop, which is how the team came together. Garrett is also able to help Marco in the shop as he has had an interest in motor vehicles for a long time, and has worked as a lube tech to a service manager and everything in between. He has built three cars since high school and said he got the “bug” for working in automotive, so when the opportunity presented itself, it was too good to pass up. Dyno Authority will be teaching some tuning classes at the shop in Redmond through EFI University, open to anyone interested in learning about tuning and how to use the Dyno. Beginning and advanced hands-on classes will be taught on February 8 to 10, 2013.